PC Gamer just received some news from Blizzard Entertainment in the form of a trumpet-playing cardboard tube and a scroll announcing some upcoming Hearthstone information. 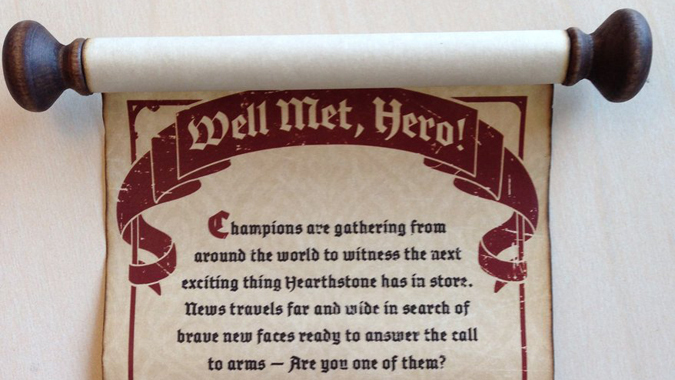 The scroll read, “Champions are gathering from around the world to witness the next exciting thing Hearthstone has in store. News travels far and wide in search of brave new faces ready to answer the call to arms — Are you one of them? Muster for battle and mark July 22 on your calendar. The next bit of news won’t come by carrier pigeon — thankfully, we have much better ways of communication now. Victory awaits.” So something clearly is on the horizon here, the question is…what? The folks at PC Gamer seem to think this is pointing to a new Hearthstone expansion on the horizon, especially given that the Goblins vs. Gnomes expansion was also teased in a piece of mail — a blueprint. Given that the last Hearthstone content we had was a new Adventure, it only stands to reason we may be seeing an actual expansion this time around. There are likely clues in the text and in the message itself — personally, I’m thinking the trumpets and fanfare sound kind of like we might see some sort of Argent Tournament inspired something or other — but at this point, it could be anything, and all bets are off when it comes to speculation. PC Gamer also posted a YouTube video of the tube being opened, which includes the fanfare. It’s a clever way to tease something new — we’ll have to keep our eyes peeled later this month for the announcement. For more information, and a closer look at that scroll, check out the details on PC Gamer.